The team of Bill Stromberg & John Morgan appears incapable of doing film music any injustice. Classic filmusic is already made of gold, but these two squelch the mere attempt to tarnish it. The music of Victor Young, a paragon of the cinematic arts, receives faithful representation in their hands. The only selections, not previously unreleased, come from "Gulliver's Travels," and virtually everything is more than competent. The sound for the album is authentic, as are the performances from the orchestra. It is difficult to believe that these are not remastered period recordings! The extensive, if sometimes unclear, liner notes by Bill Whitaker keep interest, and additional notes by John Morgan make reading the booklet a pleasure. The album opens with Young's witty 'Prelude (March)' from "The Greatest Show On Earth." It is a sprightly, atypically fancy circus march, unmistakably the work of Victor Young and thus unapologetically entertaining. 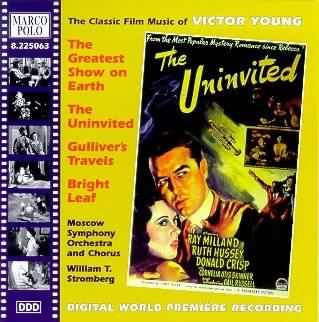 Following is a suite of music (reconstructed by Mr. Morgan) from "The Uninvited," arguably the finest ghost movie yet. The lovely Rachmaninoff-styled main theme in the 'Prelude' would later transform into song standard form as 'Stella by Starlight,' but its appearances throughout the suite are bare icing on the metaphorical cake. 'The Squirrel Chase' is more humorous artistry from Young, its piano runs and brief pseudo-Romantic interludes sure to garner a smile, and 'The Village' is a short, soft-spoken journey introducing a delicately humanistic side to the score. 'The Sobbing Ghost' is first mysterious, for the presence of otherworldly inhabitants now known, but then it brightens into a modest melody of amenity. This leads the listener to 'Sunday Morning - Stella's Emotions.' The cue evolves into a smooth rendering of the film's theme for Stella, but -- opposite of the track before -- becomes more mysterious. 'The Cliff' offers a full version of the Stella theme amid cyclonic modulations and the suite's first musically threatening moment. The modulations reappear in 'Grandfather and the Cliff' and the mystery motifs develop as eerily as ever; a piercing horn & trumpet call gives insight to the nature of a clouded threat. Bringing perfect closure to the suite is 'End of Ghost - Finale,' with the capsulation of the film's principal material, and the glorious final, resounding statement of the Stella theme. The suite from "Gulliver's Travels" (again, Mr. Morgan) is less substantial, concentrating more on pure entertainment than much else, but is immensely welcome nonetheless. 'Prelude - The Scroll and Storm' is a fine overture, presenting the central themes (most taken from songs by Leo Robin & Ralph Rainger) and Young's rich arrangements. One might hypothesise that the title 'Pussyfoot March' is so descriptive of the music that further comment is unnecessary... and one would be correct...(!) 'Giant in Tow' is, for the most part, cartoonish prattle -- only a playful ditty breaks apart some of the predictability. A lengthy track titled 'Gabby and the King - The Tower - The Archers' is more agreeable as the parts gel into a definite structure. 'Finale' does as a finale should in closing, but the Moscow Symphony Chorus sounds garbled, either a case of poor recording or poor diction. A suite from "Bright Leaf" ends the disc. The 'Prelude - Welcome to Kingsmont' seems almost tailor-made for the concert hall. It is a nigh-on perfect musical portrait of the American South. 'Sonia' paints the picture of sombre beauty, whereas 'Machine Montage' goes for the jugular, assertively marching forward. It is in 'Margaret' that Young tries for a tone of paranoia, but eventually gives way to a seductive tune. 'Tobacco Montage,' like 'Machine,' is a rough piece, and surprisingly acute. 'Suicide' makes things rougher, as it delves into death and despair in classic Hollywood fashion. 'Sonia and the Wedding' offers more beauty and Southern charm, along with a snippet from Mendelssohn and sheer romanticism (saddened by oppressive overtones). The darkness of 'Southern Vengeance - The Fire - Finale' closes the disc, the finale giving satisfying, thrilling closure to the listening experience. I heartily agree with Jeffrey Wheelers overall assessment - - this is a first class collection of wonderful music from a sadly neglected Great of Hollywoods Golden Age. I always feel it was a great pity that the late great Charles Gerhardt did not manage to include a representative sample of Victor Youngs work in his pioneering Readers Digest/RCA Classic Film Score Series. Only isolated recordings of Youngs music were available until the mid-1990s. Then his thrilling and witty score for Scaramouche (reconstructed by William Stromberg) was included on "Captain Blood" (8.223607), an earlier, 1994, release in this Marco Polo series. I thought it was the best thing on that album and I believe BBC Radio 3 producers agreed because they chose to broadcast an excerpt from it on one of their Saturday morning new recordings reviews programmes. Then we had the Koch International 1996 release (3-7365-2HI) "A Tribute to Victor Young" which included music from Shane, For Whom the Bell Tolls, Samson and Delilah, The Quiet Man and Around the World in Eighty Days. But to the music on this present album. I have heard some rather negative comments about the standard of playing by the Moscow Symphony Orchestra by some fellow critics but on this occasion they feel very much more secure (the enunciation of the Moscow chorus leaves something to be desired but I nitpick) and Victor Youngs opulent music sounds absolutely glorious. His truly memorable Stella by Starlight theme is only one element in a stunning atmospheric score for The Uninvited  todays younger composers could take a few leaves from Youngs book on learning how to write effective thriller/horror music without having to resort to all those awful mechanical synth effects. And notice how well he evokes all the thrills of the high wire in his piccolo writing for The Greatest Show on Earth. Victor Youngs delightful and tuneful Gullivers Travels music was one of the first scores that made an impression on me as a child and I was struck by how well he embraced the special Warner Bros sound in his magnificent Bright Leaf score. I mean no disrespect to either composer when I say it sounds so like the music of Max Steiner (in fact Max had to assign the task to Young because of over-commitments). This is another magnificent score with some wonderfully souring romantic melodies and evocative writing in the three montage episodes. I should mention the 32 page booklet with movie stills, very good analytical notes by Bill Whitaker and interesting informative notes about the orchestrations of these scores (large orchestras were necessary to achieve Youngs rich opulent sound) by John Morgan.